In this exclusive preview of Teen Titans, Kid Flash takes on Superboy! In DC Comics' relaunched Teen Titans series by Scott Lobdell, readers have witnessed a new team of young superheroes rally together to battle against an unlikely opponent: the psionic clone Superboy. 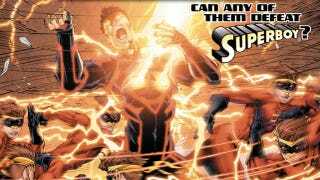 In this exclusive sneak peek of next week's issue, watch as Teen Titans Red Robin, Wonder Girl, Kid Flash, Solstice, and the all-new superteen Bunker take on Superman's ferocious facsimile. In their first battle as a team, The Teen Titans square off against N.O.W.H.E.R.E. 's most powerful weapon… The Superboy! But can the cunning of Red Robin, the speed of Kid Flash and the psionic might of Bunker stop a threat that has already taken out the powerhouse known as Wonder Girl? The fight rages from a battle cruiser docked in the Hudson River to the Central Park Zoo, but as a world stands up and takes notice, there is a very real possibility the Teen Titans might not survive their high profile debut!